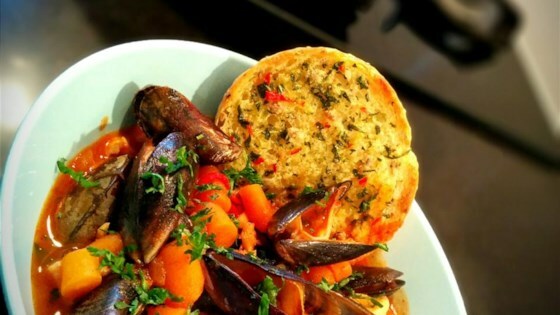 "Brodetto, a fish stew with a tomato base, is a specialty of the Marche region of Italy. There are several recipes for brodetto, even within the Marche. This recipe belongs to the province of Ancona. To make this recipe, I chose fish available in the southern United States." Heat the olive oil in a large saucepan, Dutch oven, or preferably a clay pot over medium heat. Add the onion, garlic, carrot, celery, bay leaves, parsley, and red pepper flakes. Cook and stir until the onion has softened and turned translucent, about 5 minutes. Stir in the mashed tomatoes and cook for 15 minutes over medium heat. Add the fish. Pour in the vinegar or wine. Cook until the liquid has almost evaporated, about 10 minutes; pour in the fish stock. Cover, reduce the heat to low, and simmer for 10 minutes. Gently mix in the clams. Cook until clams have opened (discard any that don't open) about 2 minutes, and then stir in the shrimp. Cook until the shrimp are pink, about 3 minutes. Place a slice of toasted bread in the bottom of each bowl. Ladle brodetto over the bread and serve immediately. Try a simple weeknight version of the hearty Brazilian classic. You can use 2 1/2 to 3 pounds of any mixed fish--swordfish, squid, red snapper, shrimp, clams, mussels, and lobster. Clean the clams and mussels well and put them into the stew whole. When I make brodetto for a large group, I cook the whole lobster in the stew, then remove the meat from the tail, chop it, and put it in the stew. I put the whole remaining lobster shell on top for presentation. Some versions of brodetto use saffron instead of red pepper flakes and white wine instead of vinegar. You can substitute rice for the bread, as well. So, let me first say that this was a pretty big hit at my house. My family loved it. I agree with Suyen below. I used white wine, large shrimp, pacific sea bass and halibut… it was spot on deliciousness! Trying to decide on what seafood for the next batch!